All those square angles getting you down? Work with a circle! 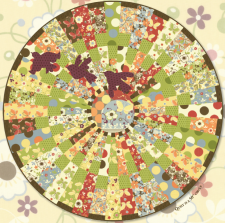 Today's project is by Momo and was created for Moda, and will result in a beautiful circular quilt! Templates for the bird applique are included, as well as detailed instructions for the project. Moda's Bakeshop no longer hosts this pattern file, but we found it at Red Rooster Quilts for you as a free download. This is an oldie but a good one if you're wanting to try something new! Enjoy!